Growing apple trees in containers can be very rewarding. They will flourish in most parts of the UK and require very little attention if a few basic cultivation rules are followed. Key points are rootstock, variety, correct watering, feeding, pruning and mulching. Get those right and you will have delicious fruit for years. See the notes further down this page for each of the dates mentioned below because they will vary depending on the climate in your area. The dates below are good for average areas in the UK. It is suitable to growing in a container. You want the variety to be one of the less vigorous types which are more suited to growing in containers. The smaller your container the less vigorous the apple tree should be. It produces apples which suit your taste buds! Different varieties produce very different apples which have an individual size, taste and texture. A variety which is suited your weather type in the UK. Some varieties are better suited to particular weather conditions. We list below several varieties which are suitable as varieties for growing in containers, tubs and pots. The varieties are in alphabetic sequence. If you have already selected an apple tree variety, skip to to the next section about rootstocks, the second key to successfully growing apple trees in containers. The main reason for choosing an apple tree such as Discovery is that it produces some of the earliest of all apples, they are normally ready in late August. The downside to this is that the apple trees don't keep well, a week at the most. The apples are covered in a shiny red skin and on the small side making them attractive apples for children to snack on. The balance of sweetness and acidity is spot on and the apples have plenty of crunch to them. You will need a suitable pollination partner nearby because Discovery is largely sterile. The apples keep for only a week, best eaten straight from the tree. Another top tasting apple producer with just the correct amount of sweetness and acidity for most adult taste buds. There is a commonly available sport called Red Falstaff which has a more red skin but otherwise is identical. Being self-fertile it will successfully produce fruit on its own. Apples are produced slightly later in the season than normal, early to mid October and they will keep reasonably well for a month or two. Growth rate is moderate to average making them ideal for containers. Some consider the taste to be bland even if sweet and crisp-textured. 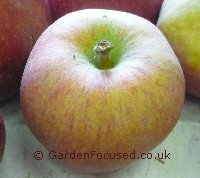 One of the more modern apple tree varieties, bred at the East Malling Research institute and first making an appearance in 1972.It has been warded an AGM by the Royal Horticultural Society in 1993. One of its parents is Cox and it takes many of those good qualities adding a few more of its own. Eminently suited to growing in a container, the fruits are delicious and the tree has good disease resistance. Apples are produced mid-season. Partially self-fertile although would benefit from another suitable apple tree nearby to ensure optimum pollination. 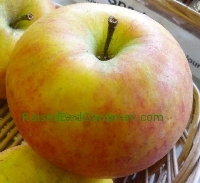 Many rate this variety as one of the best tasting of all the Cox apple types. Slightly sweeter than normal Cox flavour this is a crisp and juicy apple. 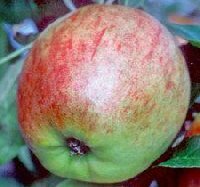 Although originating from New Zealand the parents are most definitely English and this is a classic English apple. Not too vigorous so it grows well in a container, the blossom in late Spring is very attractive. Produces apples regularly every year. One of the very best eating varieties for container growing in the UK. Sunset produces smallish apples green, yellow and red flushed which are very attractive. The apples are produced mid-season around late September to October time. it has excellent disease resistance so is a very choice for the amateur or lazy gardener! Apples are produced regularly every year with blossom appearing in mid May so they are unlikely to be damaged by late frosts. The "experts" claim that although crunchy and sweet the apples lack depth of flavour and aroma some years. However a search for reviews by the public indicate that this is one of the most popular tasting apples. Crisp and sweet with a Cox like flavour. Also good for juicing and cider-making. Storage times are on the low side, a month at most in cool conditions. The above five varieties would be our choice for container growing but there are of course others to consider. Adam's Pearmain, Alkmene, Egremont Russet, Greensleeves and Red Windsor are all excellent choices. Having selected a variety, you need to choose a rootstock. If you have already chosen a rootstock, click here to skip to read about which pots / containers and soil / compost is best for your container grown apple tree. M27 Rootstock - the most dwarfing of all the common rootstocks. The tree will grow the shortest of all (typically about 1.8m in a container). It is also the most demanding of the rootstocks requiring frequent small amounts of water. Its tolerance to adverse weather conditions is not good and it is not suited to colder or more exposed parts of the UK. M9 Rootstock - in most cases we would choose this rootstock, it is still dwarfing but more vigorous than the M27 above. Eminently suitable for growing apple trees in containers it is capable of standing a small amount of neglect. On average trees grown in containers on this rootstock will grow to 2.3 metres in height but pruning can very easily reduce the height by 30cm. Fruit tends to be produced early on this rootstock. WHICH ARE BEST, BARE-ROOTED OR CONTAINER GROWN? Both are just as good as each other. Bare rooted apple trees can only be bought in winter when they are dormant, container grown trees can be bought at any time of the year. We prefer bare-rooted trees because they are cheaper in general and also because the choice of varieties is larger. However these last two factors are becoming less applicable in recent years. Whichever you choose it is best to plant your trees as soon as they are bought. Container grown trees should not be left in their containers for too long, a month or so at the most, because they are too small. Bare-rooted trees need to be planted in their new container as soon as they arrive. If the weather is just too cold or raining they can be "heeled into" the container with some surrounding soil over the roots until conditions improve but don't leave them like that for longer that a week or two. As far as apple trees in containers are concerned the larger the container the better and the more moisture (whilst still remaining free-draining) the soil retains the better. Those are the two key rules to remember. When buying a container for a fruit tree remember that it could easily be in the same pot for 10 years or more if it is large enough and the larger the better for your apple tree. Cost is clearly a factor to consider but also consider how the pot and tree will look in your garden. As far as size goes the minimum we would recommend is a pot which is 35cm / 14in wide (inside of the pot) though of course the larger the better. Large pots will reduce the amount of watering required and this becomes even more important if you need to leave your trees for a week or so. Plant the tree in the large pot right at the start, there is no benefit to be had from starting with a small pot and moving it to a larger pot later on. The two key types of commonly used containers for all fruit trees can be classified as porous or non-porous. 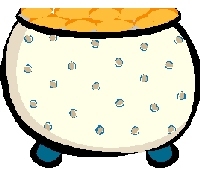 Porous pots are those which allow small amounts of water and air to pass in and out of the pot surfaces and include wood, clay and terracotta types. Non-porous pots are those which do not allow water or air to move in or out of the pot surfaces and these include plastic and metal types. The difference between the two types in growing conditions for your fruit tree is so minimal as to be almost irrelevant. 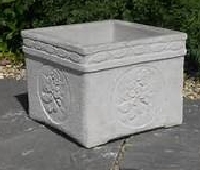 Neither is there any evidence to indicate that round or square pots make any difference. As far as shape is concerned, pots which narrow towards the top are definitely not recommended because it makes transferring the plant to a larger pot very difficult - it is almost impossible (without breaking the pot) to remove an established fruit tree from a pot which narrows towards the top. Pots which are a lot taller than they are wide should also be avoided for two reasons. Firstly they will be more likely to blow over compared to a pot with a wide base. Secondly, tall pots restrict the room for productive root growth. The ideal pot is one where the width of the top is roughly the same as the width at the base and also the height. Some small narrowing towards the base is fine but not too much. The final consideration, but a very crucial one, is drainage. Some manufacturers of plastic pots have indentations at the base which need knocking out to allow drainage. Make 100% certain that you examine the base for good drainage holes before you fill the pot with soil. If there are no drainage holes then you will need to make them yourself. Almost all non-plastic pots have good drainage holes, but even so, check just to be sure. The medium you choose for growing your fruit tree in is crucial to its long term success. Our choice is simple, use John Innes number 3 (or similar) compost. This consists of a mixture of loam (carefully selected top soil), peat or peat substitute, grit / sand and fertilisers. It is designed specifically for large container grown plants and does the job extremely well. Some feel compelled to add a quantity of of multi-purpose compost to the mixtures but this is not needed. John Innes have been formulating and selling compost for many decades and they know exactly the best combination of ingredients to provide the best growing medium for your apple tree. Yes, for a given amount it will weigh more when you buy it, which may be inconvenient as far as transport is concerned, but your tree will be in that compost for a very long time and it's well worth the one-off extra effort. In fact a key advantage of a loam based compost such as John Innes is that it will weigh the pot down more than a general purpose compost making it unlikely that strong winds will blow it over. As in many things in life, preparation is key and if you have selected the correct container and fertilisers as outlined in the the above two sections much of the job of planting your container grown apple tree is done! Prepare the pot by placing stones, broken pot pieces etc in the base of the pot to a depth of about 2cm / ¾in, this will assist drainage and help keep the drainage holes clear. The planting methods then differ slightly depending on whether your tree is bare-rooted or container grown. However one key point remains the same, plant the tree to the same depth as it was in the container or in the field. Bare-rooted trees will have a clearly visible soil mark around the trunk near the roots and this is the depth is was growing at in the field. For container grown apple trees the top of the existing soil marks the level to plant the tree in the new container. For bare-rooted trees fill the container with some of the compost / soil and place the new tree on top of it in the container. Check that the soil mark on the trunk is about 5cm / 2in below the top of the container (add or remove fertiliser to ensure the correct planting depth). Spread out the roots if they are bunched together and then infill around them with the compost. keep filling with compost until it reaches 5cm / 2in below the top of the container. Leaving this space at the top of the container will allow you to add a layer of mulch later. For container grown trees loosen and remove some of the soil around the edges of the roots. Add some fertiliser to base of the container and place the new tree in the container. Check that the top of the soil of the container grown tree is about 5cm / 2in below the top of the container (add or remove fertiliser to ensure the correct planting depth). Infill with compost until it reaches 5cm / 2in below the top of the container. When you are infilling with compost (both bare-rooted and container grown) you need to ensure that no air pockets are left in the new soil. To do this firm down the soil gently as you add it. You need to support the tree with a stake at this stage and there are lots of opinions on how best to do this. To a certain degree it will depend on how much your tree will be exposed to the wind and how strong the wind is in your area. The windier the conditions the more substantial should be the stake. However it is a basic principle that some movement of the tree should be allowed at the top, this will stimulate the tree to put down strong fibrous roots which will not only support the tree but also enable it to take up moisture and nutrients. We suggest a stake which is 2cm to 3cm square and a height of about 45cm / 18in above soil level. So, if your container has a soil depth of 35cm / 14in you will need a stake which is 45cm + 35cm high - 80cm in total. A stake with a pointed end is best to avoid disturbing the roots too much. Insert the stake into the soil so that it is about 8cm / 3in away from the edge of the trunk. Gently work it down to the bottom of the container till it is on the base, firm the soil down around the stake. The stake needs to be tied to the trunk and it's easiest to use specially made tree stake ties which can be bought online or at garden centres. Allow some slack in the tie so the tree can move slightly and make sure it is not tight against the trunk. You will need to examine the tie over the years as the tree trunk expands in size to adjust it and ensure the tie is not cutting into the trunk. Water the apple tree well not only to ensure that the compost is moist but also to settle the compost down. We strongly recommend that you then add a layer of mulch to the top of the compost. Add enough to bring the mulch to the top of the container. We use wood chip which has been rotted down for a few months but any mulch will do the job of retaining moisture. Gravel stones look good and are available to buy in small quantities. Watering an apple tree in a container is a balance of giving it a sufficient amount of water to maintain its health but, at the same time, excessive watering may cause the rootstock to rot or suffer with mould. If a container grown apple tree is open to the elements and has a mulch on the surface of the soil it should not need watering at all from October to March. During that period it will either be shedding leaves or entirely dormant and at the same time there will be sufficient rainfall to keep the roots moist. From April to September much depends on the weather conditions in your area. To test when to start watering place a finger 5cm into the top soil and if it feels damp then no water is required. If it feels dry then water is probably required. Initially water at the rate of a pint a week. In cooler wetter areas this will probably be sufficient. In warmer and drier areas try a pint and a half a week. When the weather is very warm you may need to water twice a week. Apple trees are best not fed with high nitrogen fertilisers, they simply encourage root growth at the expense of fruit. In fact for optimum apple production they benefit from minimal feeding. 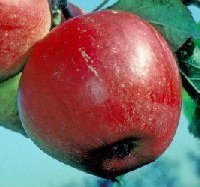 Many gardeners feed their container grown apple trees only once a year with a long lasting fertilise with good results. We would recommend a feed in April and July using blood, fish and bone. Temporarily remove most of the mulch from the surface scatter a good handful of long-lasting fertiliser over the top and gently work it into the soil surface with a trowel. Replace the mulch on the top and you're done. Every two or three years your tree will definitely benefit from a refresh of the compost. Do this in January to February (from three years old onwards) by removing the tree and root ball from the pot (you may need another person to help you do this) and then using a trowel to gently tease away about a quarter of the soil from around the edges of the root ball. Place the tree and root ball back in the pot and add new John Innes 3 compost to replace the removed compost, firming it down the edges of the pot. Pruning apple trees in containers is no different to pruning a normal apple tree. Do follow the pruning instructions which come with new trees. There are hundreds of articles on the internet about pruning apple trees so take your choice. If you want a recommendation, one of our personal favourites on this subject can be found here.